I made a short walking trip in Mustamäe and Kristiine, then came back to Mustamäe. I'll do a separate post for Kristiine part. So this is in the edge of Mustamäe, on Mustamäe way. That building is the highest in Mustamäe, 17 floors. Before renovation. The cross of Tammsaare way and Sõpruse avenue. Ducks near the Lepistiku park, every winter. There is a big busstop right next to them. 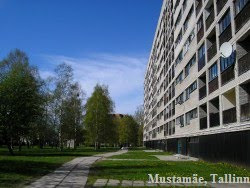 That building is the longest in Mustamäe, as far as I know, 8 doors. Fantastic view again! Now I live in this area ad I see this very often. View from the cross of Sõpruse avenue and E. Vilde way. Back then this heavily used cross was still in its old form. Now it is all different, with more traffic lights and so.